When I signed up for BlogHer ’12 last year, I don’t think I had a clue of what I was getting myself into. I’d only just started my blog at that point, and my primary motivation was to spend quality time with my besties of 5-1/2 years, Daily Cynema and My Kinda Rain (the latter, whom I still hadn’t yet met IRL). At least a month ago, maybe two (time passes so oddly in the interwebs), I got added to a Facebook group for BlogHer ’12 attendees. The group was a great place to ask questions of the veterans about things like business cards and media kits, and it eventually turned into a constant chatter of shoes, cab ride hookups, and sniping. In other words, it was like every other BBS-type setup I’ve ever been on. You can’t put that many people in an enclosed space, even online, without some measure of “Lord of the Flies” action coming out. It’s just the nature of things. So, as prepared as I could be, I set off with my rolly bag (a standard carry-on), packed with clothes and an empty duffel bag. The train ride from Providence to New York was a blast; my seatmate was another blogger who works near me, and we chatted the entire way down with each other and the nice young man who sat across from us on our speedy Acela voyage about 200mi south. The first evening was a matter of settling in; my besties and I hung out briefly and then we adjourned to a relaxing dinner of tapas and sangria with long-time friend Local Kitchen, who was super-cool about braving midtown traffic to come meet up with us. Our first full day in New York was spent primarily doing touristy things, like getting My Kinda Rain on camera for Good Morning America, as she tried to get a hug from Sam Champion, followed by a trip to the other end of the island to bear witness at the World Trade Center Memorial. From such joy and amusement to such sorrow and stillness…it was quite a contrast. I’ll never understand the people who grin and mug for the camera in front of a monument to the death of thousands of people. But, I suppose this is neither here nor there. The rest of the day was spent on more BlogHer-type stuff, going to the opening address, which was delivered via satellite by none other than President Obama (!!! ), followed by “Evening at the Expo”, an opening sprint through the expo area to get a sense of which vendors were there to try to gain our ears (and vice versa). We eventually finished the night off at one of the hotel bars, commandeering a sizable portion of the back area with a number of bloggers and a couple of company reps. Much conversation ensued, and that’s all a good thing. Our second full day in New York, the first full day of the conference, was spent bouncing back and forth between “Geek Bar” sessions (intimate gatherings in shared space, to talk about specific topics on blog maintenance, improvement, etc.) and the expo. When we missed lunch entirely due to our workout with Bowflex (which won each of us our own Bowflex CoreBody Reformer! ), we ended up “eating at the expo”, walking through and nabbing samples here and there to sustain us for the evening. The night was punctuated by unbelievable events, like waiting in a seemingly endless line to gain entrance to the Hasbro party in Times Square, only to discover (much to our delight) that we did manage to be part of the coveted first 300 entrants (which meant we would receive a “swag bag” of goodies upon departure). Swag is a major component of this conference, whether plucked from the expo floor or obtained through one of the parties held on or off-site. In some cases, it’s clearly just a gift; in others, it’s an invitation to a review or an offering to encourage further contact. This, dear readers, was the reason I brought the empty duffel bag, and I filled it to the brim over the course of the long weekend. 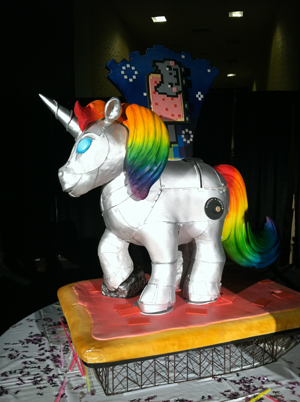 We finished the night at a BlogHer institution: the Sparklecorn party. Part 80’s dance revival, part gay nightclub, part rave, and part “lots of random stuff in one place”, Sparklecorn seems to have something for everybody (except those who don’t like to dance, drink, or wear glowing items). The last full day in New York, which was the second day of the conference, we started off with a breakfast held by Disney Jr. The new channel took over the space on my Comcast dial previously reserved for SoapNET, so I’m still mourning the loss of “Beverly Hills, 90210”, but the breakfast took some of the sting out of it. Not only did I get a hug and smooch from Minnie Mouse, I got to bring home two Minnie dolls for the kids and a really swanky iPad cover for dh. Yes, I can be swayed, but I still miss my shows. Ah well. I also got exposed to more of what dd’s friends are likely watching (and probably ds’ friends, as well), so I’m a bit more prepared with an answer when they ask to turn on the TV. Following the breakfast, we had more Geek Bar sessions, which we mixed in with logistics – getting our Bowflex equipment to the business center to ship home and starting the potentially endless process of sifting swag into piles to keep, exchange or toss. (There is a swag exchange where people drop off swag they don’t want and pick up any spare swag they want from what was discarded by others.) This was followed by the really fantastic experience of going to my first Disney advance screening, a first look at “The Odd Life of Timothy Green”. (I’ll be posting my review later this week.) I’ve been to a handful of screenings, at best, but never for anything Disney, so this was a real treat. We then followed that up with a post-screening reception, with movie-themed drinks and swag. Of course, swag. More and more swag. Twenty-four swag. Sunday morning, we all scattered to the four winds. My Kinda Rain took off well before dawn so she could make it home in time for her daughter’s mid-morning baptism. Daily Cynema had a shared cab organized to get her to the airport in plenty of time for her flight, so she headed out around dawn. I took off for Penn Station shortly thereafter, lingering long enough to get a shower before heading home on the earlier train I’d rebooked to the night before…so I could be home to have lunch with dh & the kids. Amazingly, the swag is almost entirely unpacked. Some of it has already been put to good use (like the Disney Jr. items). Some is about to be put to good use (things I don’t need but that I’ll be putting into an opportunity drawing to raise money for my marathon walk next month), and some will either get used shortly (for evaluation and potential outreach to a company) or will be Christmas gifts for the kids. My overall evaluation of the value? Impossible to quantify. I packed so much into the weekend – seeing old friends, making new ones, and building a sense of what I want to do with this blog for now – that I can’t even get my brain screwed on entirely straight. I will be tinkering, somewhat, but my core message and focus will remain the same. If I add a review or giveaway here or there, know that it’s only for things I actually WANT to review or give away. I have no desire to become a clearinghouse or paid ad. Anything new I can do will be based on new relationships I’ve formed that allow me to offer things I like to others. So there will be slight tinkering. All in all, it was an amazing time and I’m very glad I went. We’ll see if I make it to Chicago next year…but if My Kinda Rain and/or Daily Cynema are up for it, then so am I. This entry was posted in blather and tagged blogher by crunchymetromom. Bookmark the permalink. thank you for the detailed information about blogher this year will be my first blog her and im excited to be going. looking forward to the whole experience. which is better to go train or plane, I was thinking plane on southwest cause they allow you 2 checked bags but im not sure? also my kinda rain thats @gutimom right lori ? I have never met here but shes in mamavation and I know of her online. I loved how you described the blogher group so descriptive and comical .